For weeks, plenty of White Collar faithful have asserted two likelihoods: That James is up to something, and that season four, like those before it, would end on a cliffhanger. Those viewers look damn intuitive after “In The Wind.” Then again, White Collar has become increasingly self-referential of late, and tonight’s finale in particular leaves a trail of intimations that history might repeat itself. There’s Mozzie’s cheeky condition of “no base jumping” while securing the evidence box (a callback to season three’s “Countdown”), not to mention Neal reminding Peter that casing the Empire State Building necessitates “no U-boats,” followed by Peter’s reassurance that, “from Kate to the evidence room, it’s all about justice.” Hell, even good ol’ Caffrey alias Nick Holden makes his dashing return for a diversionary faux-proposal to Sara. In actuality, that was all misdirection, lulling us into a sense of eminent closure more befitting of a series-ender. 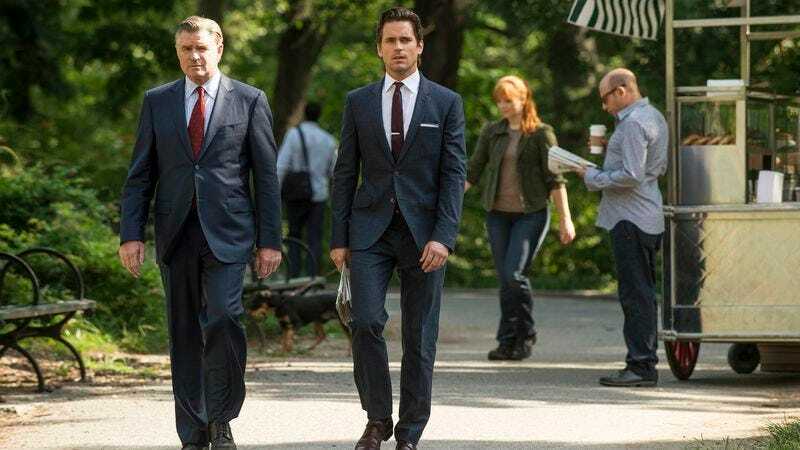 But, of course, White Collar will be back for round five, meaning that while one journey—Neal coming into his own under Peter’s mentorship and severing ties with his criminal legacy—is wrapping up, an entirely new imperative will drive future episodes. Now, the onus is on Neal to embody and pursue justice. It’s a symbolically super-heroic transition, not that far-fetched when one recalls the show’s admiration of comic books in season one’s “Hard Sell,” or how closely the themes of paternal betrayal and wrongful blame figure into so much Marvel and DC lore. It was only a matter of time until Peter’s Harvey Dent-esque crusade to thwart corrupt Agent Calloway (a returning, still underwhelming Emily Procter) and murderous Senator Pratt (the certainly not-coming-back Titus Welliver) landed him in hot water. Which, at least, is better than acid in the face. Plus, Collar’s unlikely to approach The Dark Knight’s bleaker characterizations, so it’s safe to assume Peter won’t become a hardened villain after his false imprisonment for allegedly killing Pratt. That deed occurred by James’ hand, and he’s been withholding the truth that he did in fact murder his supervisor all those years ago, and thus had duplicitous intent in finding the evidence box. It was easy enough for anyone paying close attention during the heist-plotting scene—including Mozzie—to pick up on James’ ulterior motives. It’s fair to ask how Neal didn’t, but our canny grifter’s proven that his only Kryptonite is fatherly affection, or at least the potential for family reconciliation. Not that Neal’s being entirely naïve. James is a fundamentally decent man, but he’s also a coward and con artist whose history of poor judgment calls have come at the expense of his own innocence, his son’s self-worth, and, now, Peter’s life and career. That climatic succession of events successfully escalated the caper’s unpredictable tension (and, as always, terrific use of its primary location), but it’s hard to blame anyone who found it all a bit frustrating. You don’t really want to see Peter, arguably TV’s most scrupulous FBI agent and an all-around good guy, carried away by a sashaying Calloway as Elizabeth obliviously readies for their sushi dinner (those plans more or less portended Peter's fate). It’d have been nice for James to either turn himself in or for Neal to force the issue, perhaps even see a Luke/Vader Jedi moment between father and son. Alas, White Collar has chosen its path. Namely, to both continue grounding the show in its lithe entertainment value and bulge a bit around its thematic middle. Peter’s impending legal imbroglio is a juicy cliffhanger, regardless of how high it raises the stakes. Any series worth its Gucci suits will keep finding ways to put its lead protagonists in new and—to quote yet another past episode title—compromising positions, even if it’s always fairly clear who’s on the side of good. And for Neal, it’s time to prove he’s learned from the master and can fight evil on his own, anklet-bound feet. Peter sleeps shirtless—and while spooning? James Rebhorn, back as Reese, continues his winter 2013 takeover of cable television. Once again, funny Caffrey is a welcome Caffrey, especially when incredulously asking Mozzie, Peter and James, “How is it possible that three grown men don’t understand what’s going on here?” when they stumbled in on him and Sara. So, was the whole proximity cloner-card thing a direct nod to Prison Break? For those on location-scout watch, Neal and June were outside the Hotel Wolcott on 31st St. and 5th Ave. There’s a great oyster bar not far from those parts. Did Sara really mean to say, “A lot can happen in 30 seconds”? Sara and Neal’s relationship going forward also has some intrigue, and I have to admit being sold on their chemistry. Mozzie trying to take the champagne: Classic Mozz. Hey, what’s wrong with Westchester? James’ parting words to Neal: “In this life, somebody always takes the fall. Don’t let it be you.” But he already did! And now he’s trying to do better! Jeez. Looks like Neal’s the guiding influence in that dynamic. It’s been another great season. You are all awesome for reading and commenting so thoughtfully and entertainingly each week. Hopefully I’ll see ya back here later this year?